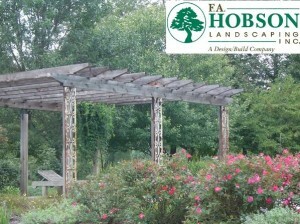 A Pergola provides both form and function to your outdoor living space. Pergolas provide support for everything from chandeliers and ceiling fans, to small speakers, outdoor lighting, even fabric. You’re only limited by your imagination. Pergolas extend your outdoor space, offer a variety of design options, and can be tailored to fit your outdoor lifestyle. If you’re in search of a way to create an outdoor oasis, one that offers energy or tranquility (or both), a pergola might be the perfect enhancement to your F. A. Hobson Landscaping patio. Call us and see what we can do for you – 410-739-6800.